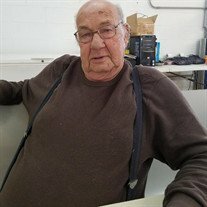 Pleasant "Tootie" Vaulner, 75, passed away July 6th, 2017. He was born October 4th, 1941 in Cord, Arkansas. He was of the Baptist faith. He enjoyed going fishing and loved logging and cooking. He especially enjoyed time spent with his kids, grandkids, family and friends. He was preceded in death by his father, Pauline "Orville" Vaulner; his mother, Estella (Cooper) Vaulner West; his step-father Virgil West; a younger brother, Calvin Vaulner; a brother-in-law, Bill Flinn; sister-in-law, Julia Vaulner; and a great-grandson, Barrett Vinson. He is survived by three sons, Paul Vaulner and his wife Debra, Jeffery Vaulner, Jason Vaulner and his wife Johnna Vaulner; one daughter, Cynthia Vaulner; one brother, Arvil Vaulner; three sisters, Jessie Belle Flinn, Shirley Pauline West, and Bettie R. Mather and her husband Paul; six grandchildren, Ashton Vinson, Cameron Vaulner, Cooper Vaulner, Jaylee Vaulner, Gabbi Mcquay, and Jaiden Hutchison; many nieces, nephews, and friends. Visitation will be Monday, July 10th from 5-7 PM with the funeral service beginning at 7 PM both at the Willis Funeral Service Chapel with Bro. Tommie Boles officiating. A private family burial will take place at a later date at Hopewell Cemetery of Cord, Arkansas.